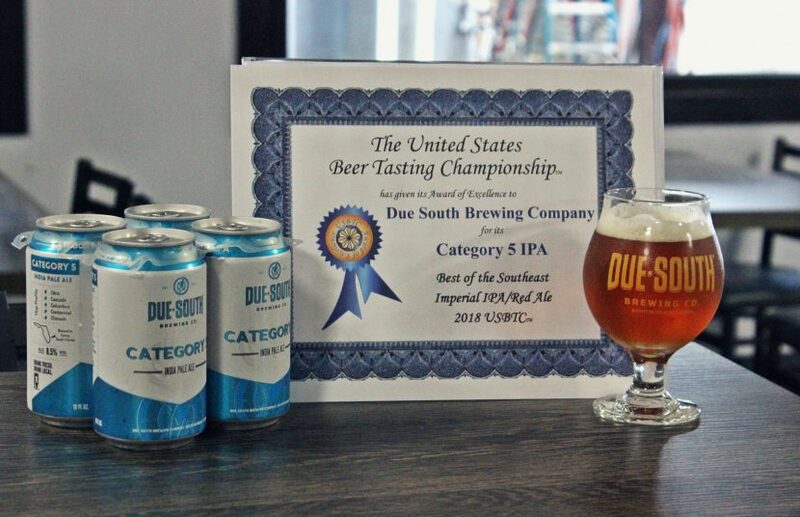 Category 5 IPA Wins Best Imperial IPA In The Southeast – Due South Brewing Co.
We are proud to share that Category 5, our year-round Imperial IPA, has been named the Best of the Southeast in the Red IPA / Imperial IPA category at the 2018 United States Beer Tasting Championship. This adds to the pedigree of our most popular IIPA, which includes such awards as the 2014 Best Florida Beer Championships Second Runner Up – Best in Show, and 2017 Can Can Awards Silver Medal – Imperial IPA. Due South Brewing joins other Florida winners in the Southeast including Cigar City Brewing Co., Copperpoint Brewing Co., and Big Bear Brewing Co.
Want to taste it for yourself? We have it on draft in our taproom every day we’re open, and have four packs available to-go. You can also find it across South Florida at great beer bars like Yard House, and at great beer package stores.